In the 2013 Western Conference Semifinals, the Blackhawks trailed the Detroit Red Wings 3-1 in the series going into Game 5 in Chicago. The Hawks, being thoroughly worked by the Wings in Games 2-4, looked like they would be heading home from the playoffs early. The Hawks won the Presidents’ Trophy with the best regular season record in 2013, and were the No. 1 seed in the Western Conference. None of that mattered anymore as they were on the brink of elimination, and another embarrassing exit from the playoffs. Honestly, I thought the Blackhawks were finished after Game 4. I had no faith. The powerplay was dreadful, and the Wings were having their way while being backstopped by Jimmy Howard. I thought it was over. I was so wrong, and learned a lesson about this group that I have not forgotten. The Blackhawks won Game 5 at the United Center 4-1, and then went to Joe Louis Arena and overcame a third period deficit to win the game 4-3 and send the series back to Chicago for a decisive Game 7. 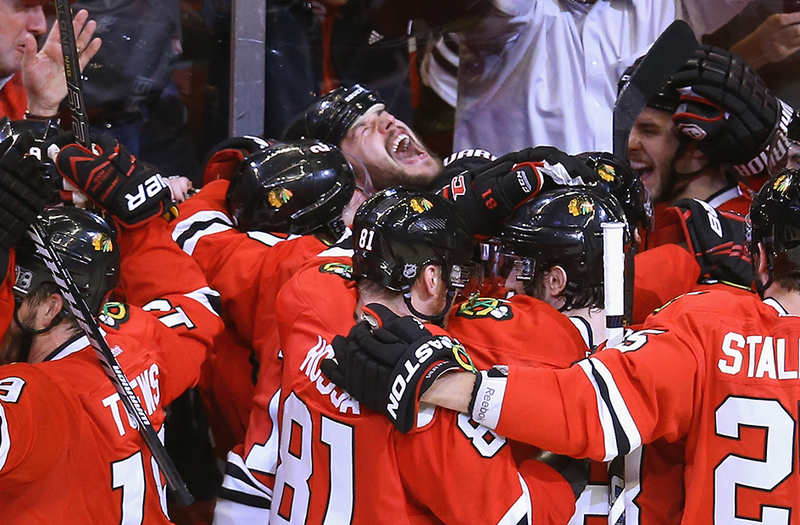 In Game 7, the Blackhawks took a 1-0 lead on a nice goal by Patrick Sharp. That lead would stand until early in the third period when Henrik Zetterberg tied the game 1-1. The Hawks and Wings went back and forth all the way down to the waning minutes of regulation when things got… crazy. One of the most egregious and unbelievably bad calls ever. It was absolutely ridiculous, and in the moment, I was calling for the referee’s head in not such a loving manner. The Hawks went from looking like they were about to win on Hjalmarsson’s late goal, to now having to go to overtime in Game 7. 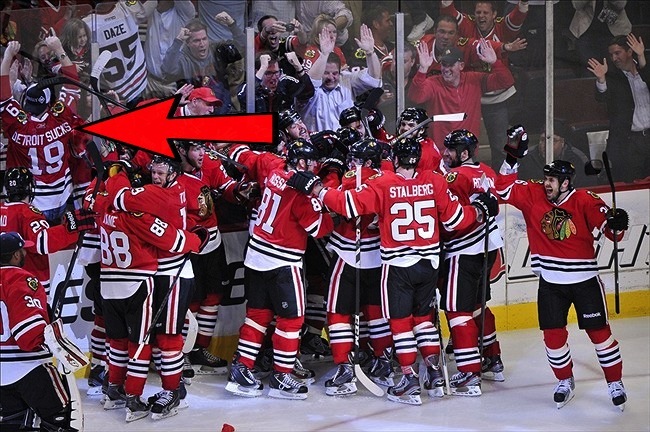 If the Hawks had ended up losing in OT… I don’t know what would have happened, but there would have been a really bad response to the disallowed goal from the fans in the stands, the team, and the league. Seabrook’s OT winner sent the Hawks to the Western Conference Finals, and capped off an unbelievable 3-1 series comeback against Detroit. Three games ago it looked unfathomable that the Blackhawks were going to be able to win the series. After Game 7, it was a feeling of pure elation as the Blackhawks had closed the rivalry against Detroit with not just any playoff series win, but a gut-punch comeback win against their bitter rivals of so many years. This goal was huge for obvious reasons. Any Game 7 overtime winner is a big deal, especially in a year where the Hawks went on to win the Stanley Cup. The Blackhawks-Red Wings rivalry has had so many stories and twists throughout the years. It was/is a rivalry full of hatred, respect and history. Two Original Six franchises, two cities that dislike each other, but are both similar and different in so many ways. The series felt like a passing of the torch from the dominant 90’s-2000’s Red Wings “dynasty” to the 2010’s “dynasty” of the Blackhawks. The comeback against Detroit in 2013 is arguably the greatest playoff series in Blackhawks history. It was easily the hardest one to win and watch in the past six seasons. There is so much respect between these two teams, that even though Detroit was a No. 7 seed in the West, they still gave the Blackhawks their best effort. That speaks to what this rivalry means, and to the parody of the Stanley Cup Playoffs in general.